FUJIFILM North America Corporation, Graphic Systems Division hails the first North American install of the Uvistar Hybrid 320 at GFX International, a Grayslake, Illinois-based visual communications firm. 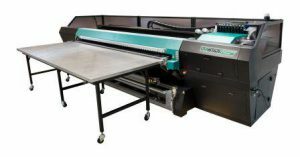 The Uvistar Hybrid 320 by Fujifilm continues to redefine the thinking about the capabilities of a combination flatbed and roll printer; and is able to produce high quality rigid and flexible output at speeds of up to 2,100 square feet per hour. Utilizing FUJIFILM Dimatix Q-Class printheads and Fujifilm Uvijet inks, the Uvistar Hybrid 320 prints full grayscale output of exceptional quality and delivers a wide gamut of vibrant colors. The press is available in an eight channel configuration delivering CMYK, Lc, Lm, Lk and Orange inks. A nine channel configuration is available that adds White ink. White ink allows for layered printing over or under an image, or it can be used as a spot color. Ortiz cannot say enough about the speed and diversity the combination flatbed and roll printer has afforded the GFX team. Today its not only about getting your customers what they want, but when they need it. Fast turnaround is critical to competing in today’s highly competitive marketplace. To be able to turn jobs around with the quality and efficiency its clients need speaks volumes to GFX’s mission statement of “using intelligence, innovation and inspiration” to del iver in-store design, execution and enterprise solutions to its retailers and brands. Through print campaigns, visual identity and interior design, GFX’s role is to help separate their clients from their competition. GFX runs wallpapers and panel-to-panel alignments, and for one of its clients, a well-known global restaurant chain, they continuously print 54 x 120 panels. “The ease of alignment is perfect every time on the Uvistar Hybrid 320,” Ortiz says. “[To date] our revenue has increased because of the Uvistar Hybrid 320, and our relationship with Fujifilm is great. Everyone (at Fujifilm) is very helpful and responsive,” concludes Ortiz. To learn more about GFX International, please visit: www.gfxi.com.